These days, the reach of professional athletes goes well beyond their performance on the playing field. Many of the top players across the pro ranks are looking to make a positive impact as role models in the community and benefit causes through the creation of their own foundations. A great example of this is Seahawks Pro Bowl Quarterback Russell Wilson, whom we recently worked with to produce the launch event for his “Why Not You Foundation”, an organization that is committed to raising awareness and resources for charities supporting underprivileged children and their families. Russell’s overarching goal is to empower children and inspire their future. Learn more the partnership on the official Invested with Russell website. A key partner in Russell Wilson’s community effort is Russell Investments, a Seattle-based investment firm who shares more in common with Seattle’s star quarterback than just a name. Russell Investments has a strong track record of giving back to their community and the two created a team effort that began last season in the “Invested with Russell” program, in which the firm made a foundation donation every time Wilson generated a touchdown for the Super Bowl bound Seahawks. So it made perfect sense when the pair put on last week’s event at CenturyLink Field, a private fundraiser to launch the new foundation. Russell took questions from Seahawks sideline reporter, Jen Mueller, as part of the event program. At 3 Point Productions, we strive to put on the best production possible with every event, and we were extremely pleased with the result of the night. 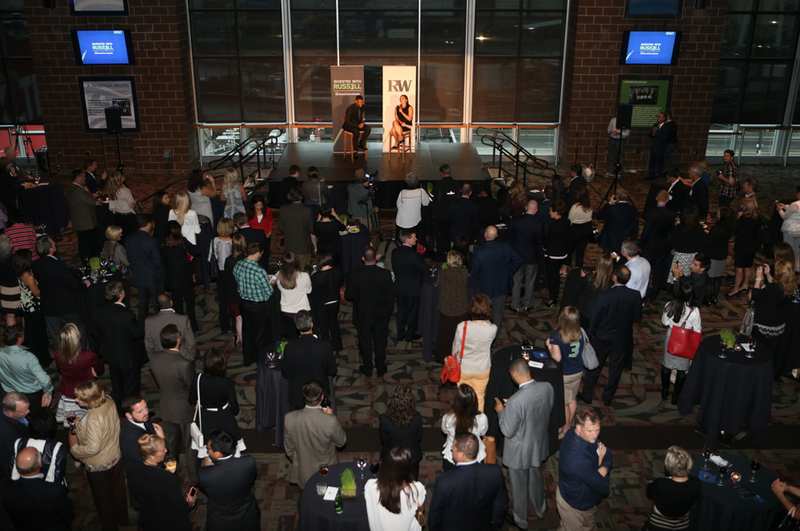 The opening hour provided time for guests to mingle in the setting of the 12s, with opportunities for photos wearing a Seahawks Super Bowl ring in front of the branded backdrop. The program portion featuring an inspiring crowd address by Russell Wilson, followed by a Q&A where event emcee, Seahawks sideline reporter Jen Mueller, prompted Russell to open up about his thoughts on everything from preparing for games to his weekly visits to Children’s Hospital. The program capped off with a live auction featuring several unique items, including Russell’s game worn shoes from the recent Super Bowl rematch with the Denver Broncos, in which he marched the Seahawks down the field in overtime for the game winning drive. Russell with winners of his game-used autographed cleats auction. The pair raised $6,000, with all proceeds benefiting the Why Not You Foundation. With a large number of athletes increasing the focus on their foundations and community efforts, we continue to build our network with an eye on becoming the nation’s “go to” producer for their events. We were thrilled for the opportunity to continue building our relationship with Russell Wilson and his community partners…having crossed paths with a large number of athletes over my career, I can honestly say that Russell is one of the most genuine in his efforts, on and off the field.